What are Dark Circles (Black Circles)? Dark Circles are dark discoloration of the skin around the eyes. “Under Eye Dark Circle” is the simplest term for these skin blemishes. This eyelid skin condition is also called “Periorbital Melanosis”. Dark circles under the eyes (under the lower eyelids) are a frustrating problem, causing an aged & tired look. Management of under eye dark circles requires a multi-specialty approach and appropriate diagnosis of the causes of dark circles. No amount of under eye concealer can counteract the shadowing that occurs when under eye problems (eyelid bags, eye bags, dark circles, black circles, tear trough deformity) occur. As a matter of fact, dark circles under the lower eyelids may be the most common eye problem that patients present with, to an eyelid surgery specialist (Oculoplastic Surgery). The periorbital (under eye) skin tissue is only half a millimeter thick, making it the thinnest skin on your entire body. Thin skin is one of the two main reasons why dark circles form under your eyes. The second is the amount of blood vessels flowing directly beneath this incredibly thin, semitransparent skin. There are many alternatives (Remedies for Under Eye Dark Circles) to treat Dark Circles. Make-up: You can use under eye concealer in the under eye area to lighten the skin and reduce the dark circles. When the problem is minute, eye make-up is a great, non-invasive and inexpensive treatment. As the problem worsens, however, make-up cannot fully hide the changes and may in fact begin to highlight it. Skin lightening creams: In certain people and ethnic groups, the skin in the under eye area darkens. This can be due to actual pigment changes in the skin or from very shallow blood vessels just below the thin skin. When it is pigment related, skin whitening creams, such as hydroquinone & kojic acid, can turn beneficial. Rarely will these types of creams completely fix the problem, but they can make an observable improvement. Never self-medicate these creams as they themselves can cause pigmentation, if wrongly used. Soft tissue dermal fillers like Restylane, Juvederm and Perlane can help feather the edges of the fluid accumulation under eye areas of puffiness/malar bags making them less obvious. Filler injections can also treat under eye hollows and a deep tear trough deformity very well. But, this must be done by an oculoplastic surgeon with enough expertise in the ocular and periorbital tissues. In general, puffy eyes and under eye puffiness are a very difficult problem to treat and fractional carbon dioxide (CO2) laser skin resurfacing has yielded encouraging results in the treatment of this entity. Under eye dark circles are treated with a combination of lifestyle change, a dedicate skin care regimen, laser resurfacing and under eye creams for dark circle removal. Some patients may also have associated diseases like low haemoglobin which may need treatment. Lower eyelid fat repositioning and blepharoplasty: When fat in the lower eye socket begins to come forward, it creates a bag in the lower eyelid. A crease forms at the bottom of the bag over the bone of the eye socket. Lower eyelid surgery (blepharoplasty) is performed to move fat from this bag into the upper cheek and tear trough, which fills in the depression and restores the fat to a normal position, where it was before it descended into the cheek. In some people, a portion of the fat is also removed. In others a small amount of skin below the eyelashes is also removed. 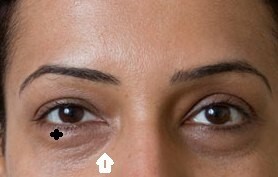 All of these techniques serve to smoothen out the transition (curve) from the eyelid to the cheek, which is a hallmark of a youthful, rested appearance. Mid-Face Lifting Surgery – A Mid-face lift can be used via an extended trans-conjunctival (from the inside of the eye) blepharoplasty incision, thereby restoring the contour of the lower eyelid and the malar (cheek) area of the face. Mixing potato juice with cucumber juice in equal quantities helps if there is puffiness along with dark circles. Cucumber juice is a common remedy. It should be applied daily around eyes and washed off with plain water after 15 minutes. Tomato juice is also said to lighten skin colour. Dark circles can also be treated by mixing cucumber juice with lemon juice in equal quantities. Apply daily and wash off with water after 15 minutes. Accurate diagnosis is the most important step. Bags in the area under the eye can be a result of fluid accumulation or displacement of fat. Fluid and fat, are responsible for causing puffiness under the eyes. When a fat pad that cushions the eyes, begins to pull away from the bone of the lower eye and sags due to age, it results in puffiness. Heredity makes this more of a troublesome thing for some people. Differentiation between fluid or fat under the eye area is very essential as fat displacement is treated by Blepharoplasty (eyelid surgery for repositioning the fat). Given our nocturnal lifestyles, poor nutrition and regular usage of cosmetic products; under eye dark circles have become a very common problem in both men and women. Dark circle removal is thus the most important concern of a patient seeking cosmetic improvement of the eye area. Even though there are several topical creams available for dark circle removal, they are not always effective or are long lasting. Before you consider a viable solution for dark circle removal, it is important to understand what causes dark circles. Soft tissue dermal fillers: This is the most preferred and minimally invasive treatment for dark circle removal. Dermal fillers like Perlane, Restylane and Juvederm correct the under eye hollows, which accentuate the under eye dark circle appearance. Deep tear trough deformity is also corrected by dermal fillers, which also help in dark circle removal. Laser resurfacing: Carbon dioxide (Co2) laser skin surfacing is an effective way of under eye puffiness removal. Darkened skin under the eyes can also be corrected using laser resurfacing over multiple sessions spread across weeks. Blepharoplasty: Blepharoplasty or lower eyelid surgery is performed to reposition fat from the under eye area into the upper cheek. This reduces the under eye puffiness and also helps in dark circle reduction as well as removal. Mid-face lifting surgery: Although this is adopted as the most extreme measure for dark circle removal, it can restore the contour of the lower eyelid and the malar (cheek) area of the face. Not only does it restore youthful appearance but also removes darkened skin under the eyes. Dark circle removal is essentially an uncomplicated procedure, but only of performed by trained occuloplastic surgeons. Dr. Debraj Shome specializes in under eye dark circle removal with both surgical and non-invasive procedures, at Mumbai, India, at The Esthetic Clinics. Dark circles are certainly not a good thing to have and something that may well be ruining your confidence in yourself. If you have dark circles under the eyes, it may be because of a wide range of reasons. If you are looking for the best treatment to remove them, then you have come to the right place. This article will explain not only the natural treatment methods to remove them, but also other procedures that you may get done to get rid of them permanently. Heredity: If any one of your parents had these, chances are that you will end up with them. Lack of sleep: If you find yourself lacking in the sleep department or that you are unable to get a good night’s rest every night, then you may be suffering from this problem. Allergies: This is a lesser known cause of dark circles. If you have allergies that are causing you to sneeze or have any other allergy symptoms, then you may suffer from these. Stress: If stress has overtaken your life, then it may be time to get rid of some because it may be the reason why there is such an infestation of the darkness around your eyes. There are many other reasons why you may be suffering from this condition. The truth is that most people who have them do not go to the doctor because the problem usually resolves itself on its own. But if that is not happening in your case, chances are that there may be an underlying issues you are not aware of. If the condition is giving you sleepless nights and making you lose your confidence, then getting the best treatment to remove them is a good idea. But the first thing to do would be to see a doctor. A doctor will be able to gauge whether there is a serious medical issue involved or not. If your condition has suddenly occurred and refuses to go away, then it is a good idea to see a doctor as soon as possible. There are some best treatment methods to remove the dark circles. Blepharoplasty: This is a surgical procedure that will get rid of the condition. This procedure pulls up the eyelids making the dark circles look less conspicuous. Laser surgery: Laser surgery to remove the dark circles is also a best treatment for the condition and something that more and more people are getting done. Laser surgery will be done with low-level laser and is a therapy that can be considered as one of the best treatment methods for the condition. What laser therapy does is it resurfaces the skin making it look younger than it is. Laser therapy basically targets the area of the eyes which is dark by sending light rays to it. This light basically gets absorbed by the skin which again gets resurfaced and this way the appearance of the condition gets a lot better than what it was previously. If going for surgery in the form of Blepharoplasty is not something that you want to do then going for laser surgery is something that you should certainly consider for the simple reason that it is a lot less invasive. Of course, laser does cause a tingling sensation to the skin which might stay for a while, but you won’t have to go under the knife or take any kind of anaesthesia for this. As you can see, there are many best treatments for dark circles, including many that can be done at home. It is up to you which one you choose. You don’t have to live with this condition any longer if you don’t want to because there are multiple avenues to get rid of them permanently. Visiting a skilled plastic surgeon like Dr. Debraj Shome at The Esthetic Clinics in Mumbai, India, can assist treat your dark circles better. Surgery to remove dark circles is a cosmetic boon for most people. The best treatment for dark circles will only be decided after examining your skin and the extent of dark circles. Sometimes the surgery to remove dark circles can also be combined with other procedures such as blepharoplasty and double eyelid surgery which will save you a lot of time and money. Dark eye circle surgery has dark circles laser treatment listed as one of the best treatment for dark circles, however it can have some limitations. Another popular dark eye circle surgery is the blepharoplasty surgery to remove dark circles. There are two main techniques of blepharoplasty that are used in surgery to remove dark circles. In the trans conjunctival approach of dark eye circle surgery the incision is made under the lower eye lid and the fat pockets are removed or repositioned. Dark circles laser treatment is also done if there are excessive wrinkles. In the Transcutaneous approach, as the best treatment for dark circles, the excess fat and skin is removed directly. This is especially helpful, when dark circles laser treatment is not helping much because of extra skin laxity.